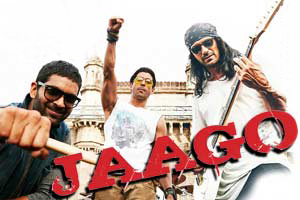 A rock song sung by Siddharth Mahadevan and Farhan Akhtar, with lyrics penned by Javed Akhtar. The video of this song is available on YouTube at the official channel Zee Music Company. This video is of 3 minutes 12 seconds duration. The lyrical video of this song is also available on YouTube at the official channel Zee Music Company. This video is of 5 minutes 41 seconds duration. Lyrics of "Jaago (Sab Jaan Jaaye Tumko)"
Lyrics in Hindi (Unicode) of "जागो (सब जान जाए तुमको)"